In today’s special I would like to share with you my experience with a product from Conserveira de Lisboa, Lda. But first let me give you a bit of background information. The Conserveira de Lisboa is a very interesting shop in the Lisbon’s downtown which first got its official name in 1942. 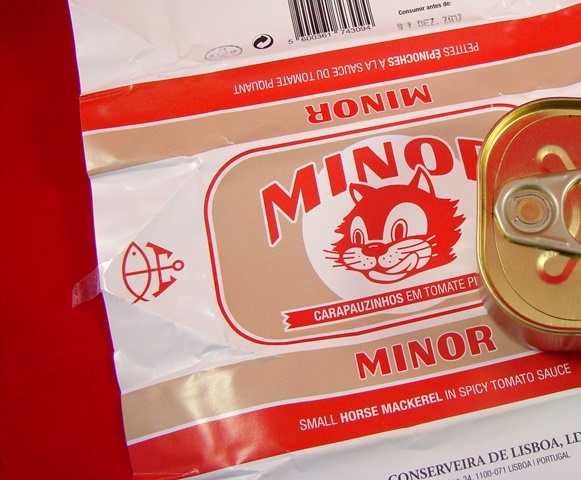 They are a family owned business which stands for the traditional trading of their unique brands of canned fish: Tricana, Minor and Prata do Mar. Their shop is now part of the Lisbon tourist route, featured for instance in the Lonely Planet guides, also in the Guide du Routard and in the Dumont ones. It also caught the attention of the international press appearing in well renowned newspapers and magazines such as the Monocle, The Guardian, Zeit and the New York Times. From their three brands I decided to go for Minor (admittedly because it has a cat on its cover). 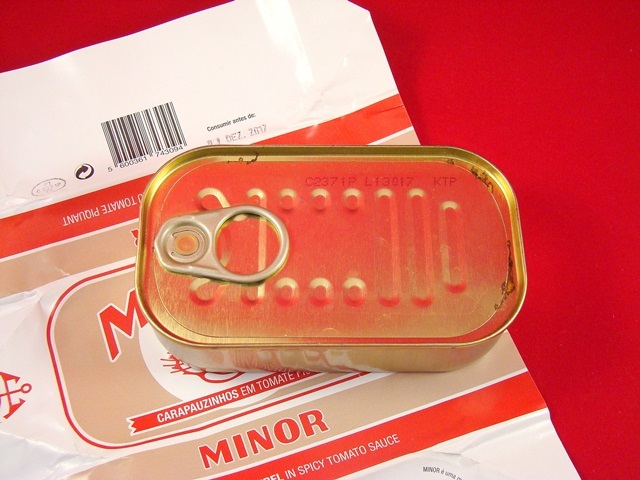 This brand focuses on small fishes, such as the atlantic horse mackerel, chub mackerel and sardines. 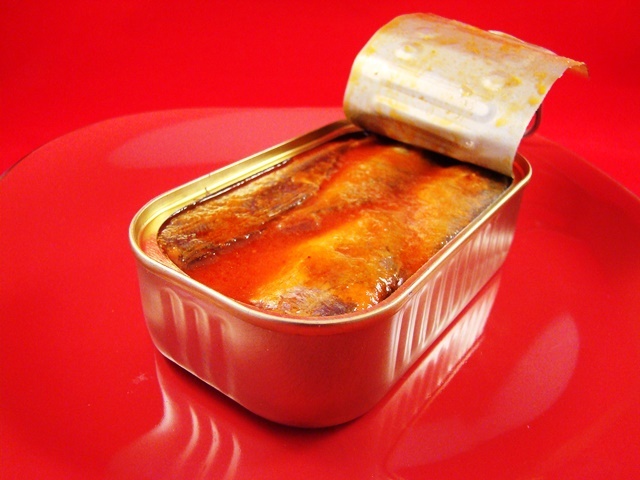 From this brand portfolio I selected the atlantic horse mackerel in spicy tomato sauce, because I usually enjoy these preparations with different sauces. Besides liking the cat on the package, I really like the whole retro look of it. The company logo printed on the side brings together the themes of fish and Lisbon. 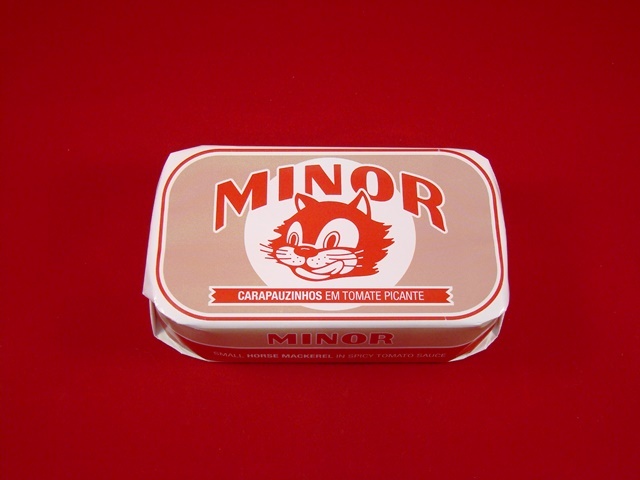 In addition, it’s quite nice that they put the name of the product in three languages: Carapauzinhos em Tomate Picante – the Portuguese version, Small Horse Mackerel in Spicy Tomato Sauce – its translation to English and Petites Épinoches à la Sauce du Tomate Piquant – for the French name. The ingredients and nutritional information are just in Portuguese though. When I removed the paper wrapping from the can, I was a bit surprised to see some rust marks. Since they were close to the top reentrancy zone, where the can is less resistant, I was concerned that my snack might have been compromised. However, the can didn’t look bulged nor was it leaking, so it seemed safe to proceed. I wondered if eventually this can was transported together many others, wrapped in plastic, exposed to somewhat cold, and then when transported to the inside of the shop I bought it from, the plastic was removed before the package had time to acclimatize and condensation formed, concentrating on those spots…would that condensation be enough to start forming rust? Honestly, I don’t know. I’m just speculating here. I trust that this kind of defects don’t happen so often, so I don’t feel it’s fair to give it too much weight to my already subjective evaluation. So let’s put a number on it: it’s a 3 out of 5 for Package Presentation. Then it was time to pull the ring and take a look to what’s inside. I had to pull a bit harder towards the end, but no big deal. In “Easiness to open” it’s a steady 4 out of 5. At first I saw 4 good looking mackerels on the rich tomato sauce. I started taking them out, and there where another 4 beneath. Although there were so many mackerels inside, each one was whole, which I see as a sign of good fish handling. Additionally, it wasn’t difficult to remove them from the inside without damaging them. The fish was firm and I couldn’t notice any fish scales. As for the flavour, the sauce was rich, meaning that it had somewhat a deep flavour like the one you get from a good homemade tomato sauce. I also found it salty and averagely hot. In summary, I liked it and I think it makes a very nice meal by it self with some bread, some salad on the side and perhaps a glass of Rosé wine. Manufacturer: Conserveira de Lisboa, Lda.